Once again it is time for our A Cappella Christmas Carol Sing Along at 6:00 PM, this December 2nd! 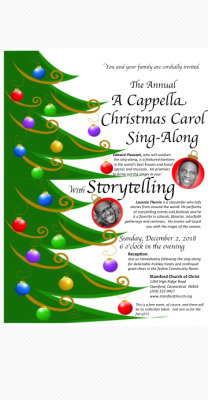 Come join us as we celebrate the season with classic Christmas Carols and Storytelling. Eddie Pleasant, a featured baritone in the world's best known and loved operas and musicals will bring out the singer in you! This is his 26th year at the Stamford Church of Christ, so please don't miss this special evening of celebrating his service to the church and community. Laconia Therrio, a professional storyteller will touch you and especially your children with stories from around the world that will bring out the magic of the Christmas season. Afterward, please join us in the community room for holiday snacks and treats. * Note: this is a free event, of course! Come and enjoy the evening.